Maybe you’ve read some of the stories this past week about how FriendFeed’s traffic is way down following their sale to Facebook. The stats don’t look good, as the site’s traffic may have plummeted as much as 30% following its peak just prior to the sale. But to anyone who has meaningfully used the site since its inception, you probably didn’t needs stats to tell you what should be obvious: FriendFeed has turned into a ghost town. One of the most compelling things about FriendFeed has always been just how easy it was to have a conversation on the site. Someone posted an item, and within seconds, many had robust conversation threads updating in the speed of realtime beneath them. This also lead to the occasional trollish activity, but overall it was great. But since the acquisition, those conversation threads have largely slowed to a crawl, or worse, don’t exist at all on many items. Previously, FriendFeed had committed to keeping the site running indefinitely despite their new jobs at Facebook. And it has remained running, but the site’s innovation, always its key attribute, has been completely halted. And perhaps as a vote of no confidence, previously rabid users are now largely staying away. And that’s really too bad. One of the key things I used FriendFeed for was to get information. There was a great system in place that would allow interesting things to bubble up based on people commenting on and the liking of items. Not all of it was great (baby pictures, while cute, get in the way of information), but overall the system worked. It was crowd-sourcing at its finest. But that obviously doesn’t work too well when the crowd has vanished. Sure, there are some items on the site that still garner a good amount of conversation and likes, but as a whole, my experience post-sale has been severely tainted. So why not just move on to Facebook, you may wonder? Because while there are similarities between what Facebook does and what FriendFeed does, FriendFeed is still much better at it. Hopefully soon we’ll begin seeing the effects of the FriendFeed team at Facebook, but so far that hasn’t happened. It’s still too slow to share, automatically imported items take forever to show up, the filtering system needs work (I want to be able to hide just a certain type of item from one friend, like I can on FriendFeed, rather than hiding everything), as does the relevance of the main stream. That last item looks like it could be close as it would appear that Facebook Lite’s “View Top Stories” will soon make its way to Facebook proper. That’s a good step, but it’s basically FriendFeed’s “Best of day” area, and doesn’t do something like push recently liked stories to the top of the stream. But more to the point, Facebook is an entirely different beast than FriendFeed. Facebook is still first and foremost a social network for people you know and want to connect with, FriendFeed was much more about information sharing and conversation. And that’s what I miss. 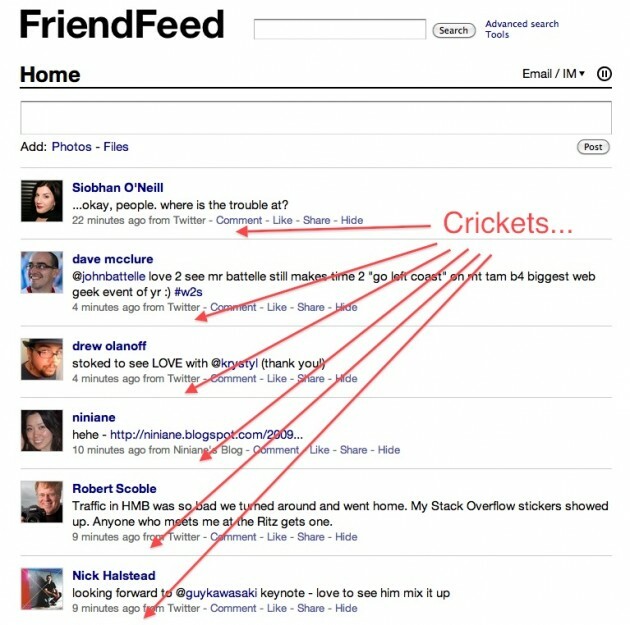 There are plenty of others ways to get information on the web, but FriendFeed was like a playground for information. It was fast and fun. And the team’s rapid pace of innovation pushed others, like yes, Facebook. Moving over to Facebook obviously didn’t make the FriendFeed team any less brilliant, but I worry about their ability to rapidly innovate in a much larger company, one that has to worry about its legacy of over 300 million users. This week, one former FriendFeeder already left Facebook. He reasoning was that he didn’t want to telecommute anymore (he lives in Seattle), but he didn’t seem to mind doing it while he was still working on FriendFeed. Read into that what you will. The bigger picture is that we see this happen all too often. A larger service buys a smaller one and proceeds to run the smaller one into the ground. Not on purpose, but because they have bigger goals for their own products. Google is particularly good at it. Jaiku, Dodgeball, you could even put Feedburner in there. Now we’re seeing Facebook do it too. The users are just along for the ride, helpless when this happens. They take our playground, and put glass on the ground. We can still play, but it’s not as fun. And eventually, everyone leaves with bloody feet — and doesn’t want to come back. We should consider ourselves lucky that Twitter hasn’t agreed to be purchased yet, it could have very well suffered the same fate. Look, I’m happy the FriendFeed team was able to get an exit that they clearly felt good about. And I realize that some services, no matter how innovative or how passionate their user base is, sometimes fade away. It’s just sad to see it go. 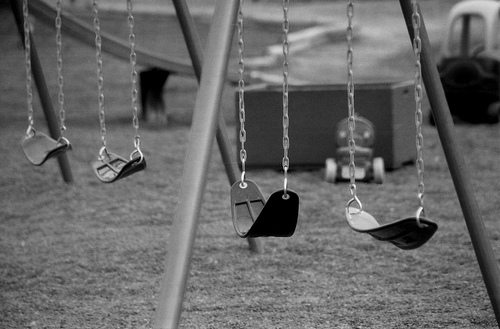 It used to be my playground.